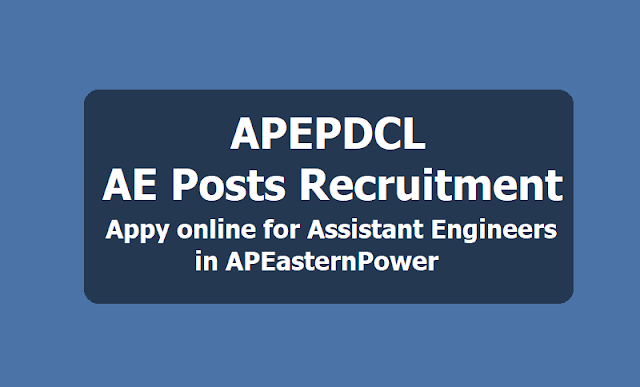 Eastern Power Distribution Company of Andhra Pradesh Limited has given AE /Assitant Engineer Electrical Posts 2019 Recruitment notification and the APEPDCL invite the online applications through APEPDCL Website from eligible candidates for filling up of the following vacancies including backlog vacancies on regular basis in APEPDCL Engineering Service. The Candidates should have age not below 18 years and not above 40 years as on date of notification. Written exam will be conducted for 80 Marks for all the candidates. However, weightage will be given to in-service candidates to a maximum of 20 marks for in-service experience in the organization as Contract worker. 1. Last date for payment of Fee at AP Online: 06.02.2019. 2. Last date for submission of Application: 28.02.2019.